Nestled on the 2nd floor of a small alley in Ginza you will find one of the most comfortable and cozy restaurant in Tokyo (in my opinion). 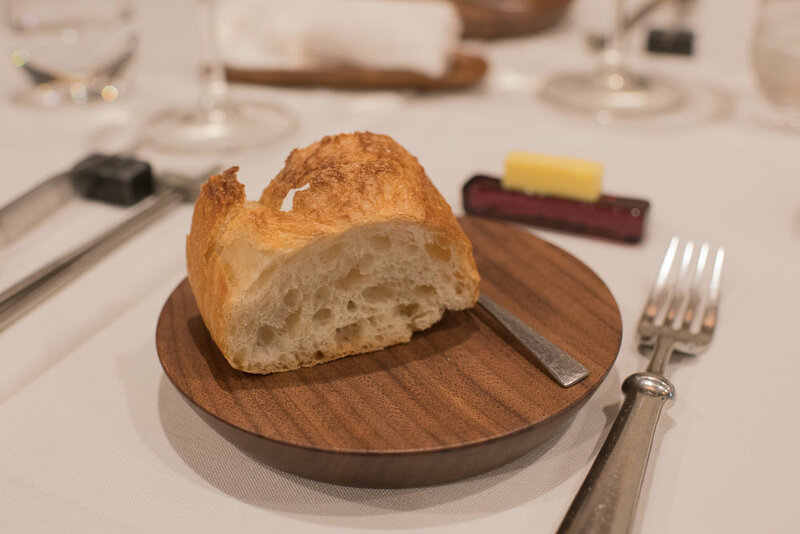 If you are familiar with the so called most expensive steakhouse in Tokyo called Aragawa, then you will find that Trois Fleches has a familiar atmosphere, only with less stuffiness. The interior has the same nuance, old school and somewhat outdated but cozy nevertheless. Unlike Aragawa, the waiters here are casually dressed in shirts instead of suit and tie and you are always warmly greeted by the owner who roams the floor of this tiny restaurant with a never ending smile on his face. The two times I have dined here, the atmosphere is always lively and unlike other Japanese restaurants you will find local patrons warmly (and loudly) conversing with each other over excellent glasses of wine. 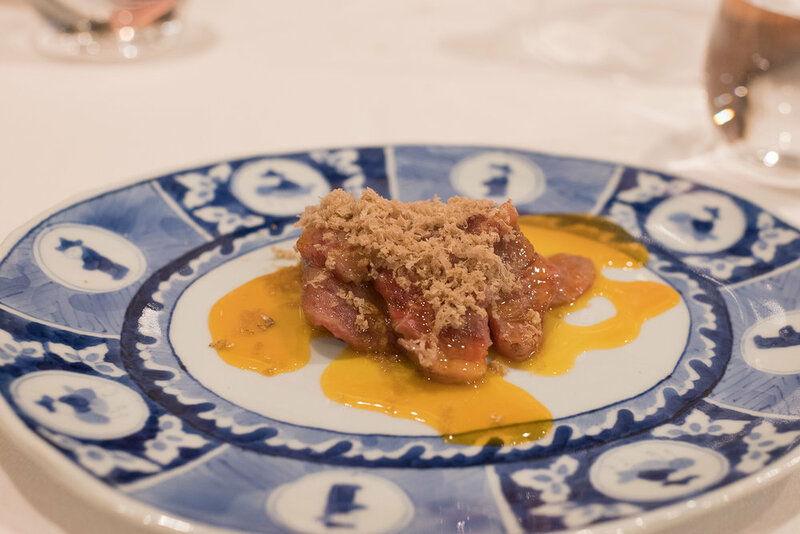 Their wine list is impeccable and the staff always know the best wine to recommend, opting to bring out bottles to the table from their extensive wine cellar instead of having you look through a wine list. Here is a picture of the building Trois Fleches is nestled in. And this is the interior of the restaurant with its open kitchen plan. 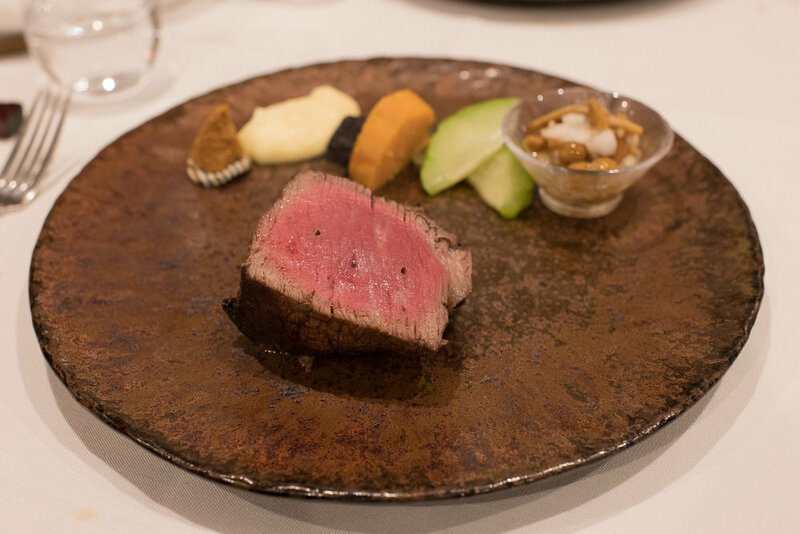 Trois Fleches serves 5 different parts of sirloin and tenderloin beef from Kagoshima, Iwate and a couple of other prefectures which you pick from. They also allow you to share if you want to try different parts. You then choose one or two appetizers to go with the beef. Now let’s start with the food. This bread deserves a picture in this post because it is really delicious. Crunchy and light and perfect with the salty butter they serve. This Shanghai crab & shark fin royal is a really delicious choice of appetizer if you eat shark fin. And this pasta with truffle is a special order that is not in the menu but absolutely worth it. The subtle butter sauce blends in perfectly with the truffle taste. 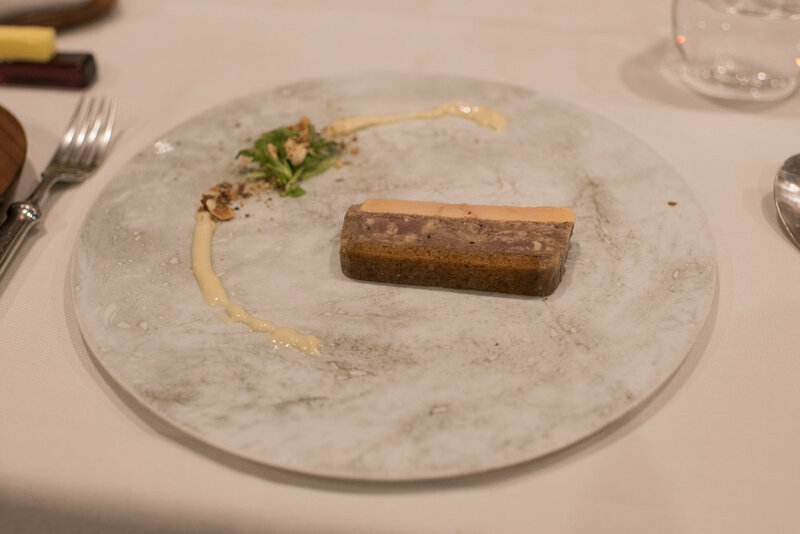 This terrine of corned beef and foie gras is also an appetizer worth ordering. The sea urchin and cauliflower cocktail was also very interesting. But the highlight and a must order is this sliced sirloin carpaccio with white truffle which is always absolutely amazing. The different meats of our main course before it is cut. My favorite is the tenderloin. 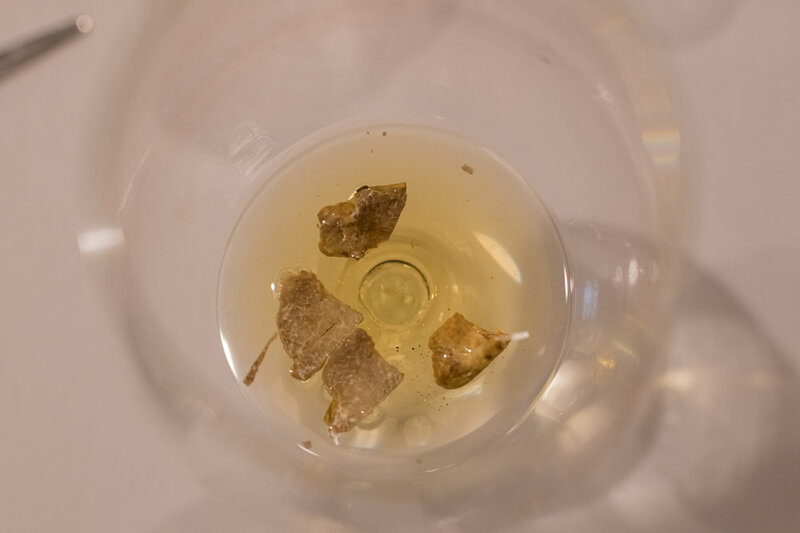 And if you are up to it, end the meal with a glass of dessert wine with slices of truffle in it. It was the first time I ever tried this combination and found it really tasty. Biting on the bits of truffles after is a treat in itself. For dessert, Trois Fleches serves a plate of small delicious desserts to share. All really, really, really good. 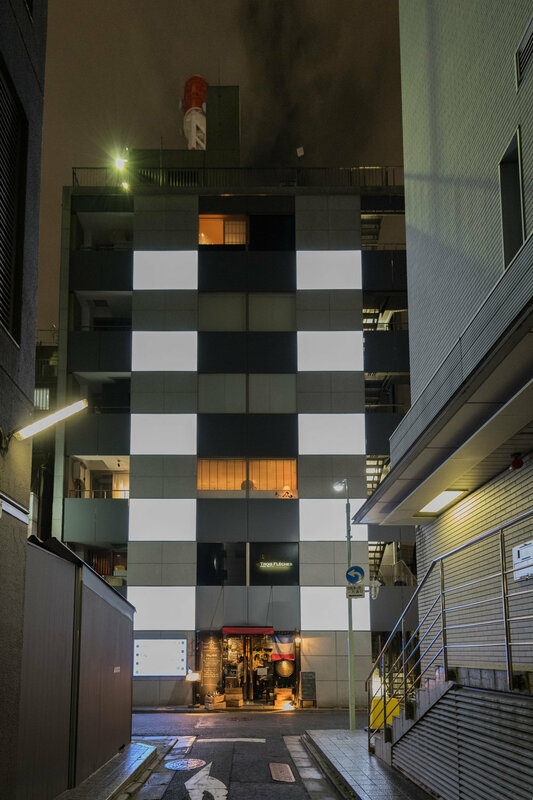 Don’t be fooled by their laid back and relaxed atmosphere because like Aragawa, Trois Fleches is not cheap. It might cost you between 40.000 to 60.000 yen per person for all this sumptuous deliciousness especially when truffles are involved. But it’s so worth it not just for the food but also the atmosphere. You always leave Trois Fleches with a smile.